The Titan chuck from Multistar should not be confused with the 125mm (5in) chuck from Teknatool which carries the same name. The Multistar Titan chuck is marketed as a compact scroll chuck, the body of which measures only 93mm (3 3/8in) diameter, but has the same-size hardened steel scroll of its 100mm (4in) counterparts. 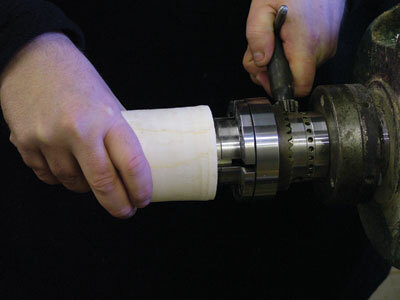 As with the Multistar Duplex chuck reviewed in Woodturning (Issue 197), the Titan is beautifully manufactured. Unlike many of the cheaper scroll chucks on the market nowadays (particularly those from the Far|East) there are no sharp edges left by the machining processes and this clearly makes the Titan more comfortable to handle and also safer. 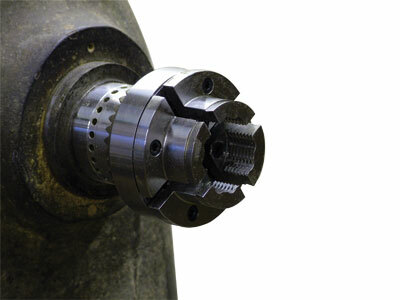 Another great safety feature is the guard that encompasses the chuck, enclosing the jaw guides. Not only does this help to prevent fingers or knuckles getting knocked, it also prevents the jaws from being opened beyond safe working tolerances. The guard also protects the moving parts of the chuck from dust. The body of the chuck is machined from high-quality tool steel and features 24 indexing holes - a very useful facility that can be used to full advantage by purchasing the indexer accessory (IU04). Talking of accessories, there is a wide range of different jaws, eight in total, and these will cover the vast majority of chucking holds required. In addition, there are two sizes of mounting plates that can be used as button jaws in conjunction with the dovetailed mounting bosses. Alternatively they can be used to mount your own homemade wooden or MDF jaws. 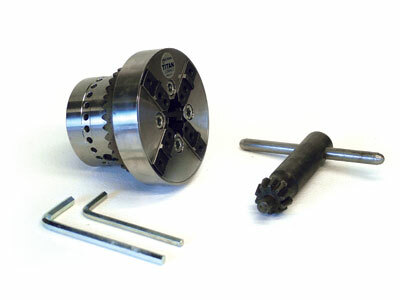 Screw chucks and faceplate rings can also be purchased to fit some of the chuck jaws. I mounted the TCJ056 jaws which involved simply screwing two hex-drive bolts through each jaw into the carrier jaws. The bolts and Allen key are provided with the chuck, but the job is made even quicker using a hex drive in a cordless drill. These jaws have a 20mm- (25/32in) deep internal bore and are machined with serrated teeth that give a very strong grip to the work. 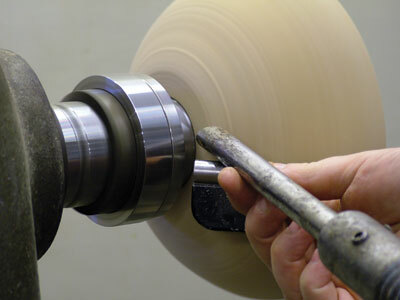 The jaws also have an external dovetail to allow 55mm (2 1/4in) recesses in the bottom of bowls to be held securely. I wanted to test the strength of grip this chuck would give me, so I decided to mount a wet sycamore log 100mm (4in) in diameter and 280mm (12in) long in the jaws on a 35mm (1 3/8in) spigot, 22mm (7/8in) deep. I made a goblet and took quite heavy cuts when hollowing out the bowl of the goblet to really test the grip of the jaws and the chuck. I found it to hold admirably and I suspect I could have done similar work 14 or even 16in away from the spigot. Next, I turned a 200mm (8in) bowl from beech. I like to turn the front and back of the bowl from one chucking, so I drilled a 4mm (5/32in) deep x 55mm (2 1/4in) hole in the bowl blank with a sawtooth bit and mounted in expansion mode in the jaws. A parallel recess mounted on dovetail jaws is not ideal, but that's the way I often do it. The grip was perfectly adequate to turn the whole bowl from this one mounting. The diameter of the chuck body, together with the protrusion of the jaws from the body, gave excellent access right the way down to the base?of the bowl. Overall, I was very impressed with this chuck. It has been very well designed, superbly manufactured and comes with a two-year Multistar guarantee. The scroll runs very smoothly and its gripping power is excellent. It may be marketed as a compact chuck, but it easily outperforms many of the 100mm (4in) scroll chucks I have used. I was very impressed. The difficult part for me will be having to return it to Hegner. "The difficult part for me will be having to return it to Hegner"